The parure of ruby and diamond jewels was made for Queen Wilhelmina in 1897. 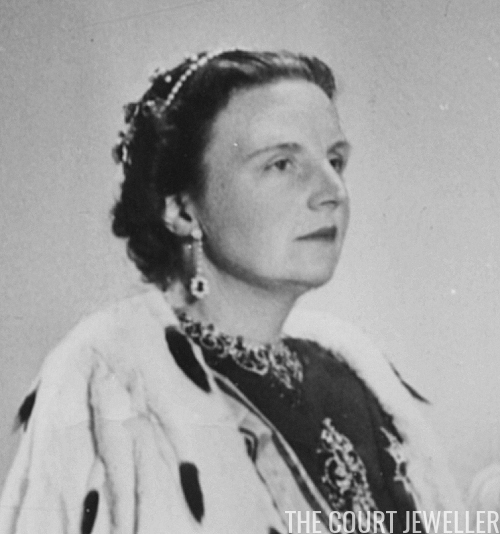 Her daughter, Queen Juliana, famously wore the necklace at her investiture in 1948 (pictured above). For years, the set was worn by Juliana's second daughter, Princess Irene, and then the necklace disappeared from public view for about half a century. 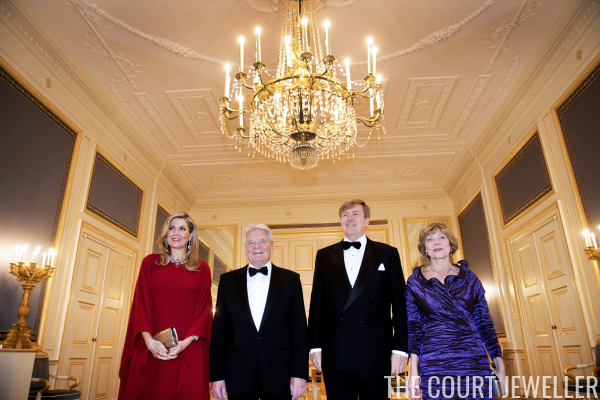 Queen Maxima had previously worn the tiara from the Ruby Peacock Parure, but the necklace didn't come out of the vaults until February, when she wore it in The Hague for a dinner with the President of Germany. The appearance is just the latest in a series of jewelry rediscoveries by Maxima, who has proved herself one of the most innovative jewel-wearing royals today.